Our brief, glorious growing season is underway here in Wisconsin. Spring onions, lettuces, ruby-red strawberries, and peas are all available at farmers’ markets. Frozen peas are a kitchen staple for most of us, and for good reason. They hold up better than many veggies after months in icy storage. But fresh peas are something else altogether: sweet, almost floral, and tender yet with a snap when you bite into them. They need to be cooked and eaten as soon after picking as possible; the sugars will turn to starch fairly quickly, and they’ll lose their sweetness. They’ll still be edible and tasty, just not … special. When you can get these little gems, let other flavors take a back seat. I combined them with delicate baby spinach and a light drizzle of lemon dressing. Fresh mint is the perfect foil for the sweet peas. A few shavings of parmesan are a salty finish. I also made the salad with a few sliced radishes. I managed to grow foot-tall plants with radishes not much bigger than peas. I did make a tasty pesto with the leaves; watch for future posts for that recipe. I really need to amp up my gardening skills. Place the peas in a saucepan with lightly salted water just to cover. Bring to a boil. Reduce the heat, cover, and simmer for about 4 minutes, just until the peas are tender. Drain the peas and plunge into cold water to stop the cooking. In a small bowl, whisk together the lemon juice, mustard, and honey. Drizzle in the oil and whisk until the dressing is emulsified (that is, completely combined and slightly thickened). Stir in the mint and chives, taste, and add salt and pepper. Place the spinach on a platter. Stir half the dressing into the peas, then spoon the peas in a mound on the spinach. 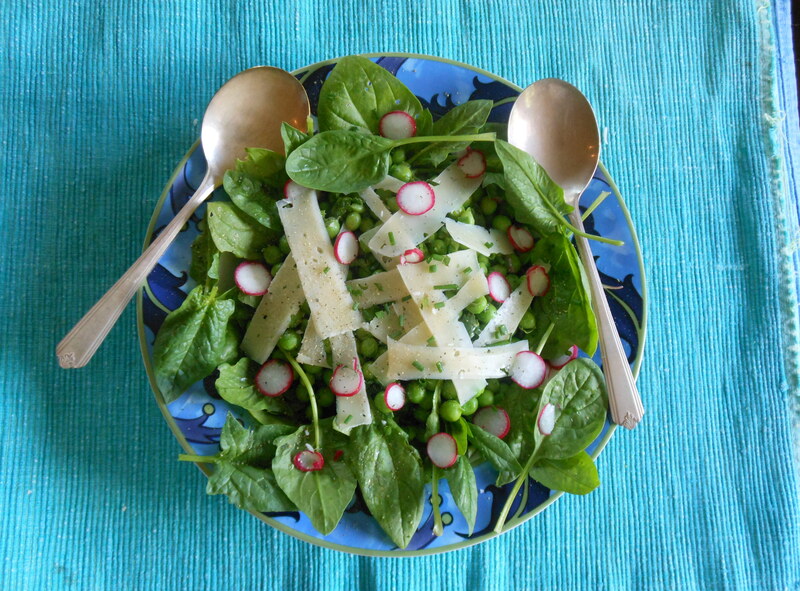 Use the vegetable peeler to shave the parmesan into shards on top of the salad. Add the radish slices if using. Serve the extra dressing on the side. This entry was posted in salads, veggies and tagged fresh peas, gluten-free, green peas, healthy, lemon, low-fat, peas, salad, spinach, vegetarian. Bookmark the permalink. Lovely blog and a lovely recipe. Oh boy. My peas are almost ready, too! 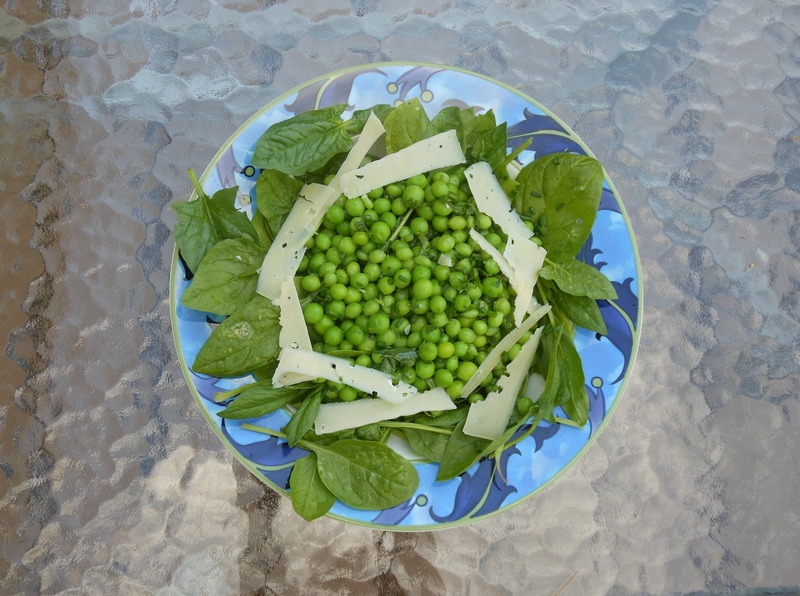 Julie, I’d never cooked fresh peas right after picking before — what a treat they are! What a nice simple and healthy salad. I love the parmesan. Thanks, Frank. It’s nice to have simple, light dishes on hot days. This looks great and I have most of the ingredients in my fridge/freezer/patio. Would you believe that I don’t think I’ve ever eaten fresh peas? I guess a trip to the Farmer’s Market should be on my agenda for tomorrow. Alice, I’d only tried fresh peas once before, and made the mistake of waiting a few days before I ate them. Such a disappointment. They really must be eaten the same day they’re picked to get all that amazing sweet flavor. Let me know what you think. Yummy! I have been looking for some yummy salads for summer. I’m going to have to try this one. Thanks, Melissa. We’ve been having an unusually hot summer, so we’re eating a lot of salads lately.